MOSCOW – A three hour long fire within the No 3 reactor block’s protective cement barrier at Rostov Nuclear Power Plant – a part of the plant still under construction and scheduled for launch next year – was extinguished by fire brigades in three hours early Friday morning, but caused several million roubles worth of damage. Though no injuries or radiation releases were reported and the fire did not affect other parts of the plant, such accidents are becoming a more regular occurrence, despite assurances from the atomic industry that it is performing well above target. Construction of Rostov (also called Volgodonsk) NPP – 1000 kilometers south of Moscow first VVER -1000 type reactor began in 1977 and began operations in 2001. Construction of reactor No. 2 commenced in 1983 and finished in 2009. Delayed work on the fire-stricken unit 3 was restarted after delays in 2009. A fourth unit is also planned for the plant. Rostov NPP’s public information division Friday said that the fire had begun and ten minute past one in the morning. The plant later offered more details saying that the preliminary reasons for the blaze, which started in cylindrical portion of the reactor’s protective barrier, were sparks from welding apparatus. The sparks led to smoldering on plastic pipes final that later burst into flames. The pipes, read the emergency situations release, were being used for final concrete pouring with the aim of creating apertures for the later insertion of steel beams to fortify the concrete structure. The burnt plastic pipe sections will be removed, said the emergency services release, and new ones will be put in their place. The fire affected some 120 square meters, and preliminary estimates said preliminary damages costs are estimated to be below one million roubles. Press reports in Russia’s official newspaper Rossiikaya Gazeta,(in Russian) however reported they were told by Russia’s Ministry for Emergency Services that some 350 square meters were affected and that it took 30 firefighters using 11 kinds of fire fighting equipment to extinguish the blaze. The fire was extinguished with the aid of cranes raising a 25 cubic meter volume of water. It was necessary to use 11 different types of fire fighting equipment,” read Komsomolskaya Pravda, siting the Emergency Services ministry as its source. “Emergency services responders worked to localize the flames and prevent their spread to the other reactor blocks. This was aided by the thick concrete walls of the [under-construction] reactor,” reported the paper, adding the blaze was put out by 4 am. Videos of the blaze appeared in numerous Internet publications, showing destroyed metal structures and burn-stained cement walls. Rostov NPP’s plant’s overall design, as approved during Soviet times and envisioned building the plant based the now obsolete VVER 1000/320 subtype reactor. Because the reactors themselves are outdated, Rostov NPP is lacking in several critical safety elements – specifically a vessel to capture molten metal from the reactor’s active zone in the events of a meltdown. And the plant also uses not two, but one-layered containment, which was the cement barrier affected by the fire. “Construction at the site is proceeding at a growing tempo of assembly. 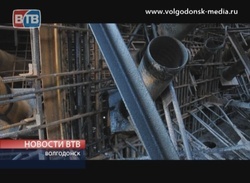 Just look at the special attention being devoted to the quality of the ongoing work, at the production culture and safety of labor ” said Alexander Palamarchuk, director of Rosenergoatom, Russia’s state reactor builder in a release (in Russian) by the company just one day before the fire. It’s possible that the rush to complete the project could be a contributing factor to the fire regulations that were violated. A representative of the contractor has stated the obvious – the fire started because violations occurred. Komsomolskaya Pravda gave a more dramatic apraisal of events based on quotes from Duma Deputy Alexander Vodoyanov, who is also an expert on ecological issues. Incidents of varying scales regularly plague the construction of nuclear power plants in Russia. One of the most notable occurred in June 2011 whe 1200 tons of metal surrounding the protective barrier of the first reactor unit building at the Leningrad NPP – 2 collapsed. Only by lucky coincidence were there no injuries. The Russian Federal Service for Environmental, Technological and Nuclear Oversight(Rostekhnadzor) has concluded that such violations have a systematic character. “The chief reasons for violations [during nuclear power plant construction] are insufficient qualifications, weak knowledge among personnel of the demands of federal norms and regulations, construction documentation and equipment,” reads Rostekhnadzor’s annual report for 2009. The situation is clear enough: When and were will the next collapse or fire occur, and will it pass without casualties?